Apple pie is the chicken soup of desserts. It fixes what ails you. Even if you didn’t know something was ailing you. 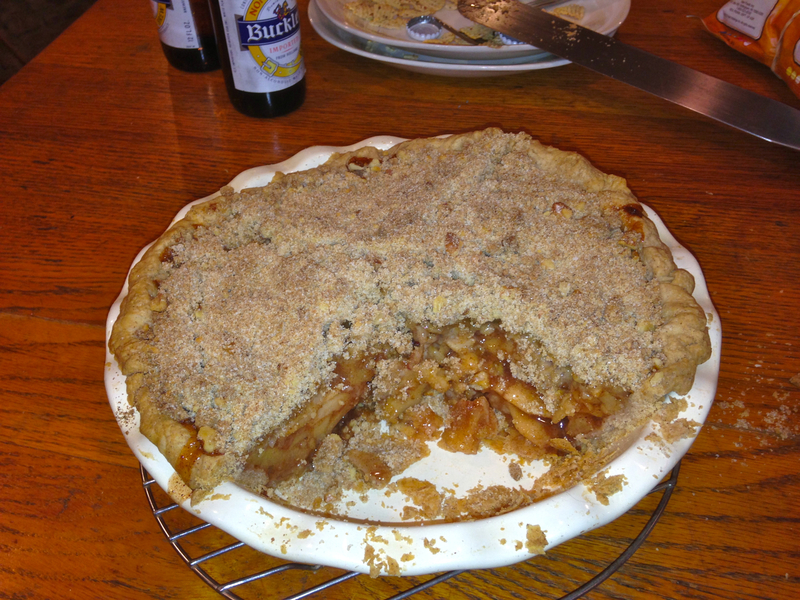 And that is true of some apple pies more than others — Gil’s recipe for a towering crumb-top makes you lick the plate. Then you feel good, apple-pie good. His pie won first prize in a very competitive contest — I still remember Gil pumping the air with his fist when the victory was announced in the library parking lot. It wasn’t typical apple-pie behavior but it was all Gil. And his is the kind of pie that will make you want to stand up and salute. Torching the top to caramelize it just a little is optional. Tak gode Applys and gode Spryeis and Figys and reyfons and Perys and wan they are wel ybrayed colourd wyth Safron wel and do yt in a cofyn and do yt forth to bake well. 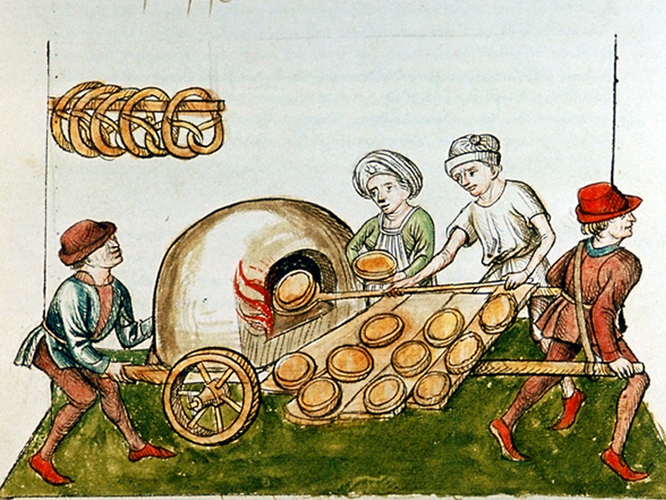 Pies were spectacles, and apples weren’t especially spectacular. The four and twenty living blackbirds zooming out the broken top crust were not just a nursery rhyme, they were real, at least for those wealthy enough to afford a feast. By Tudor times more sugar was available and we find another recipe for “pye,” this time with green apples. 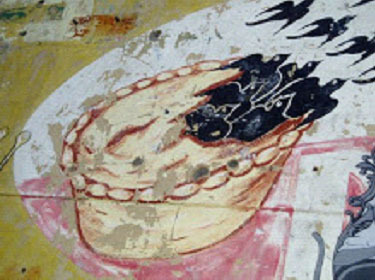 Pies in colonial america were first called puddings. 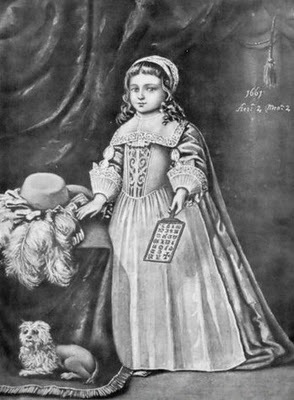 By 1759, when Swedish parson Dr. Israel Acrelius made notes on a visit to the Delaware, pie was a staple: “It is the evening meal of children.” Until European stock got established, though, American apples were crabapples. Amelia Simmons rendered her classic apple pie recipe in the 1796 cooking bible American Cookery. With its cinnamon and sugar it sounds contemporary, but the inclusion of rose-water was a throwback to the middle ages. 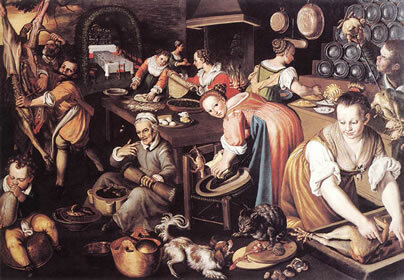 Apple pie became a compliment in 1590, when poet Robert Green praised a lady in a piece called Arcadia. They breath is like the steame of apple-pyes. That might make a good pick up line even today. There is none that can with applepie compare. Crust: Mix dry ingredients, cut in butter and lard, add vanilla and sprinkle in ice water until you can gather the dough into a ball. Chill, flatten ball slightly and roll out flat with rolling pin. Use a greased nine-inch pie pan — you’ll have extra, but make a generous edge. Bake for 30 minutes (pie weights or beans on wax paper or greased aluminum foil will keep bottom crust flat). Filling: Toss peeled, thinly sliced apples with lemon juice. Combine with dry ingredients and mix well. Bake for 30 minutes, stirring every ten or so. Assembly: Pour partially cooked apples into partially cooked crust. Mound apples up in the center of the pie. Mix topping ingredients together and mound on top of pie, spreading it around to edges. Bake assembled pie for another 30 minutes and remove to a rack. for soundtrack little green apples?